Passover Packages for IDF are not US tax deductible. Connect with the heroes of Israel who defend our freedom every day! Many soldiers spend the Passover holiday with needy families back home. to your home. Passover gift packages for IDF soldiers are not US tax deductible. Enhance the Passover experience for soldiers and their families by sending matzoh and haggadot (seder recital books). Our soldiers are on the front lines fighting for the freedom to live as Jews in Israel. You will receive a Passover Freedom Certificate as a token of appreciation. and their families. You will get a personalized Passover Freedom Certificate as a token of appreciation. Help make our soldiers' Passover experience even more meaningful by sending beautiful Passover packages filled with matzoh, wine, candy and loads of Passover food essentials. As a Platinum Partner, you will receive a personalized Platinum Passover Freedom Certificate and a very special IDF Passover Haggadah. All Passover packages are greatly appreciated by the soldiers and their families. Enter any amount that you would like to give towards these special gifts. For gifts of $100 or more you will receive an IDF Passover Haggadah. For gifts of $150 or more, we will send Jerusalem-baked Matzoh directly to your home! 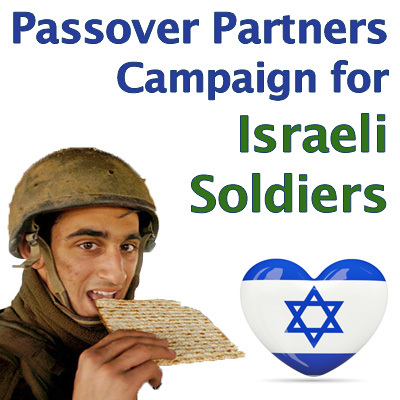 Thank you for becoming a Passover Partner with IDF Soldiers! You can receive Matzoh from Israel at your home! As an expression of thanks, Passover Partners who order packages totaling $150 or more, can receive Passover Matzoh baked in Jerusalem directly at their home. You chose Credit Card. Click Here to choose Paypal.